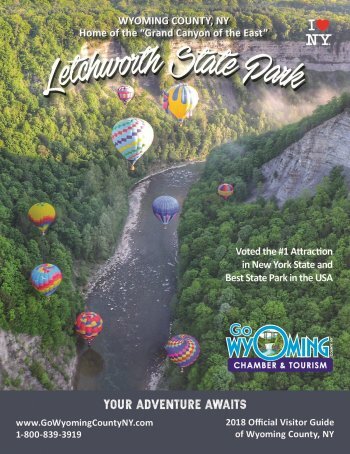 (WARSAW, NY) Tourism remains a critical component to the Wyoming County economy and the New York State’s recently released tourism data backs it up with encouraging numbers. Wyoming County Chamber’s tourism program continues to build on previous year successes by reaching out to more visitors with new promotions, targeted marketing, and strong partnerships. According to the state’s recently released data from Tourism Economics, an Oxford Economics Company, New York State’s tourism economy expanded in 2017 with 4.4% growth in traveler spending, reaching a new high of nearly $67.6 billion—27% above the state’s pre-recession peak set in 2008. Tourism in the Greater Niagara region, where Wyoming County is located, is a $2.7 billion industry, increasing 5.5% over last year and supporting 53,168 jobs. This latest report shows that Wyoming County’s tourism impact is up 5.4% representing $46.2 million in traveler spending over 2016 levels. Wyoming County is again the second highest in terms of growth year over year in the Greater Niagara region. Travelers are spending in several categories with Food and Beverage at $12.8 million leading the way, then second homes at $10.9 million, retails sales at $8.1 million, recreation at $7.4 million, lodging at $5.2 million and transportation at $1.5 million. The report also details the effect of tourism on employment and shows that between direct, indirect and induced, Wyoming County’s total labor income is $25.4 million. Further, the impact of tourism on the Wyoming County tax base is very important. Between state and local taxes generated from tourism, Wyoming County is collecting $5.4 million, which translates to savings for county taxpayers. Were it not for tourism-generated state and local taxes, the average household in Wyoming County would have to pay an additional $348 per year to maintain the same level of government revenue. For the Greater Niagara region, that number jumps to $622 per household on average. Tourism Economics, headquartered in Philadelphia, is an Oxford Economics company dedicated to providing high value, robust, and relevant analyses of the tourism sector that reflects the dynamics of local and global economies. By combining quantitative methods with industry knowledge, Tourism Economics designs custom market strategies, project feasibility analysis, tourism forecasting models, tourism policy analysis, and economic impact studies. Oxford Economics is one of the world’s leading providers of economic analysis, forecasts and consulting advice. For more information email: info@tourismeconomics.com. For more information, or to become a member of the Chamber of Commerce, please call 585-786-0307 or visit the website at wycochamber.org or gowyomingcountyny.com. The Greater Niagara Region report can be found here.